Back in June, I rounded up a group of my friends and we ventured out Niagara way. 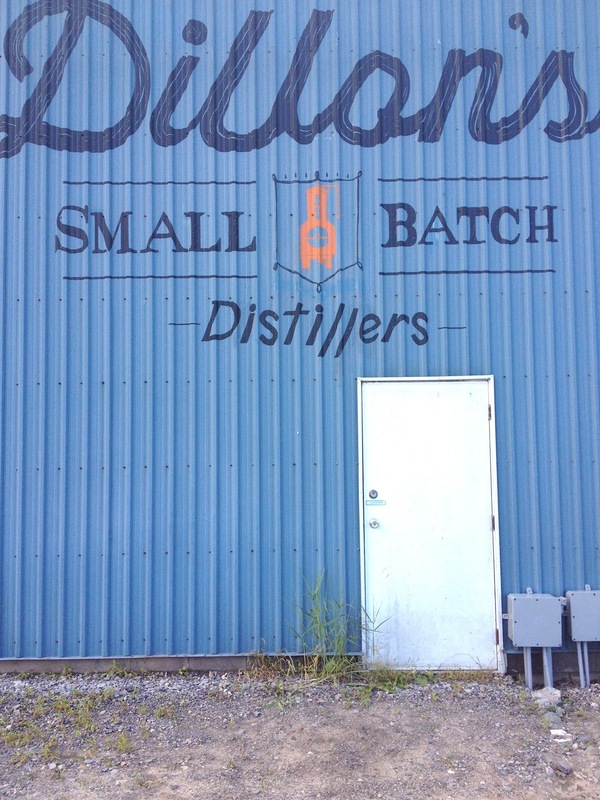 I had Friday off and it wasn't difficult to convince them to play hooky when our plan for the day was to sample spirits at Dillon's Small Batch Distillers. I've been following Dillon's since they launched in December. We have a beautiful antique bar and Adam always keeps it stocked with interesting spirits. I wanted to find a unique whisky to add to our collection -- one that was distinctly Canadian. But it seemed this great country of ours was a bit uninspiring when it came to the spirits game. When I learned about Dillon's, I was intrigued by their handcrafted philosophy, small batch approach and honestly, their Canadian pride. The branding didn't hurt either. I'm a sucker for hand drawn apothecary style design. We love that Dillon's is a family venture and that Geoff's passion for craft distilling is something shared with his father. A start up by Geoff Dillon, his father Peter Dillon and father-in-law Gary Huggins, each bring unique background and experience to distillery -- from the distilling process, to environmental considerations for its operations and managing the business itself. Dillon's is located in Beamsville along the Niagara Wine Route. With its proximity to a number of farmers in Twenty Valley, they look to the region when it comes to sourcing ingredients. Their Vodka and Gin is made from a base of 100% Niagara grapes. The rye spirit is made from 100% Ontario rye grain. Spirits are infused and finished with local botanicals. Some herbs are grown right in their backyard. Other herbs and fruits are sourced from local farmers. Smooth and full flavoured, the Unfiltered Gin 22 was hit with our friends. You can check out their full line of products here. By producing in small batches, the spirits that result from their distilling process are unique. They look to the changing seasons for ingredients that are fresh and seasonally available. The feedback of bar keeps and local establishments across the region that serve their spirits is carefully considered. They have flexibility to change things up and keep their line of products interesting. New products are already in the works. We even had a chance to try some upcoming bitters while we were at the sipping room. The Sipping Room at Dillon’s is the perfect spot to sample their spirits and bitters before deciding which to bring home. You might leave with all of them! It's warm and inviting and you feel welcome to stay awhile. They also carry a beautiful selection of glassware, decanters, books and the most delicious bitter pear caramels (I finished the whole bag on the car ride home). Afterwards you can make your way to the distillery. If you are lucky catch a tour with Geoff to check out first hand how they make their products the traditional way in copper pots using local Niagara grapes and botanicals. Lucky for us, Dillon's is a hop, skip and a jump away. When we posted photos on Instagram, many asked where Dillon's is available. The White Rye is available at the LCBO. But the distillery is gaining such momentum it has Toronto taste makers making day trips out to Beamsville to taste their spirits. Worry not though, Dillon’s will deliver right to your door. Order directly from the distillery and they’ll ship it to you. Send them an email or call (905) 563-3030. Of make a day of it and take a trip for their Al Fresco Sunday Brunch where they pair cocktails with dishes offered by local food trucks.